There are four Game 3’s in the Stanley Cup Playoffs tonight. 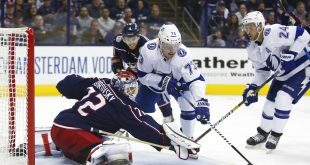 In the Eastern Conference, Atlantic Division rivals Toronto and Boston face off in Toronto at 7 p.m., while the Tampa Bay Lightning and New Jersey Devils face off in New Jersey at 7:30 p.m. The Bruins and Lightning lead these series 2-0. In the Western Conference, the Presidents’ Trophy-winning Nashville Predators, up 2-0, seek to finish off the Avalanche in Colorado. 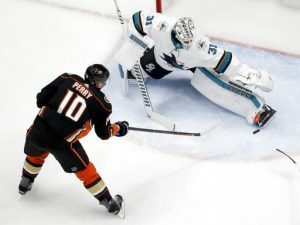 Monday night’s game begins at 10 p.m. Of the eight teams playing Monday night, the Anaheim Ducks were the only team to not hold serve at home. On the ropes, the Ducks must win in San Jose to avoid being swept by the Sharks. Their quest begins tonight at 10:30 p.m. The Boston-Toronto series has been one-sided thus far, with the Bruins outscoring the Leafs 12-4. Bruins left-winger David Pastrnak has scored four goals and five assists in the series, including a hat trick in Game 2. Pastrnak’s six points in Game 2 tied a franchise record for most points in a playoff game. Center Patrice Bergeron and left-winger Brad Marchand also chipped in four assists for Boston in Game 2. Boston goaltender Tuukka Rask has been phenomenal, with a .933 save percentage. On the other side, Maple Leafs goalie Frederik Anderson has struggled, with just a .822 save percentage. 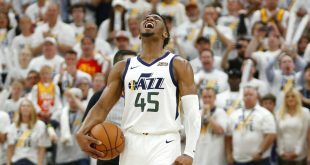 Anderson was benched 12 minutes into Game 2 after allowing three early goals. Maple Leafs coach Mike Babcock says Anderson will get the start Monday night. Pastrnak credits his teammates for making it easy for him to put the puck in the net. Power plays have been a difference-maker in the series. The Bruins have converted on five of ten power plays, while the Maple Leafs have converted just one of seven. If Toronto is to get back in the series, they will have to do so shorthandedly. Center Leo Komarov left Game 2 with an injury, and his status is uncertain. Center Nazem Kadri will serve the second of his three-game suspension for an illegal hit he committed in Game 1. If New Jersey is to get back in the series, they will need to come out of the gates faster. In Game 1, the Lightning jumped out to a 3-0 lead not even two minutes into the second period. Each team scored two goals in the final 38 minutes. 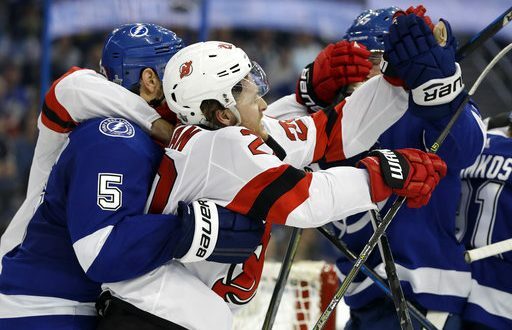 In Game 2 Saturday, Tampa Bay built a 5-1 lead before the Devils scored the game’s final two goals. New Jersey has not led in the series. 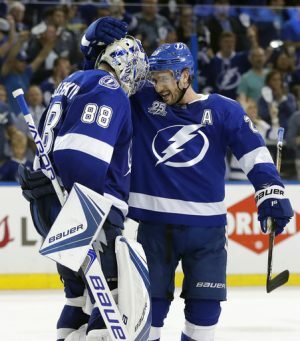 The Devils have outshot the Lightning by 18 shots, but Tampa Bay goaltender Andrei Vasilevskiy has been brilliant, posting a .933 save percentage. Unfortunately for the Devils, the shot differential is partially due to Tampa Bay getting an early lead and playing a more defense-oriented style. Perhaps playing at home will give New Jersey the energy they need to be the aggressors at the beginning of the game. Power plays have also played a crucial role in this series. The Lightning are 3-4, while the Devils are 1-5. New Jersey coach John Hynes says the 2-0 deficit can be chalked up to special teams and not taking advantage of scoring opportunities. Colorado has been surprisingly competitive against the league-best Predators. The Avalanche have led in both games and nearly came back from a two-goal deficit to force overtime in Game 2. In the end, however, Nashville simply had too much firepower. Neither team has had much success on the power play, as the Predators are 1-7, while the Avalanche are 0-8. Individually, Hart Trophy (MVP) candidate Nathan MacKinnon led Colorado with three points in the losing efforts. For Nashville, Filip Forsberg scored two goals in the third period of Game 1. The Avalanche are home, but they’ll have to deal with a mounting injury list. Defenseman Erik Johnson and starting goaltender Semyon Varlamov have been out the entire series. Rookie defenseman Samuel Girard missed Game 2 and may not be available for Game 3. Predators goaltender Pekka Rinne says he is pleased to be up 2-0, but the series is far from over. Beating the Presidents’ trophy winners and Stanley Cup favorites is difficult enough; doing so shorthanded will require an extraordinary effort. The San Jose Sharks are the only team playing at home Monday night in a favorable position. They stole two wins in Anaheim and can sweep at home. The first two games of the series have been low-scoring, with the Sharks scoring only three goals in each game. Martin Jones has been a stonewall masqueraded as a goaltender for San Jose. Jones recorded his fifth career postseason shutout in Game 1 and conceded just two goals in Game 2. The Ducks’ star players have been unable to get things going in the postseason. Forwards Rickard Rakell and Corey Perry have not produced a single point. Left-winger Evander Kane leads San Jose with two goals. Anaheim coach Randy Carlyle says his team won’t give up, and they need to clean up mistakes to have a chance at a comeback. Both teams have struggled on the power play, with the Sharks going 2-9 and the Ducks 1-5. San Jose has grabbed the series lead despite not having star center Joe Thornton available due to a right knee injury. Thornton’s status is uncertain, but the Sharks believe they will get Thornton back at some point in the playoffs should they advance.